Spool Valve - Light-weight with a precision engineered skeleton structure, the RSX power plant provides fast bolt action with abundant volume for quiet, consistent low-pressure operation. OLED Screen - Intuitive menus with easy trigger programming make set-up and adjustment in the staging area quick and easy. Grip back placement provides a heads-up view of the integrated game from a shooting position. USB Updates - Standard USB connection to the RSX circuit board makes updating the state of the art circuit board with the latest updates as easy as downloading pictures from a smart phone. Multilingual Display - Paintball is now played worldwide by millions of players, speaking dozens of languages. The RSX has the ability to download new text packs to format the OLED screen to the language of your chooice. Tool-Free Cleaning - Push-button access unlocks the RSX power plant, which slides out under spring assist for full access to the valve and bolt without tools. The power plant slides back into place and latches automatically with no risk of damaging the body by cross-threading. Lever Detents - WIth a shallow angle to the bolt, RSX spring-loaded detents prevent double feeding but swing smoothly back from the bolt for low-drag, long-life operation. Hose-Free Inside & Out - CNC machined internal gas channels route compressed air through the grip, body and regulator for maximum reliability with reduces failure points. Precision Trigger - Four point adjustment and dual sealed bearing assemblies combine to deliver a trigger pull that is short, light, fast and consistent. Q-Lock Feedneck - Professional tournament proven over generations of Shockers, the Q-Lock clamps loaders securely in place, yet opens easily with the flick of lever. 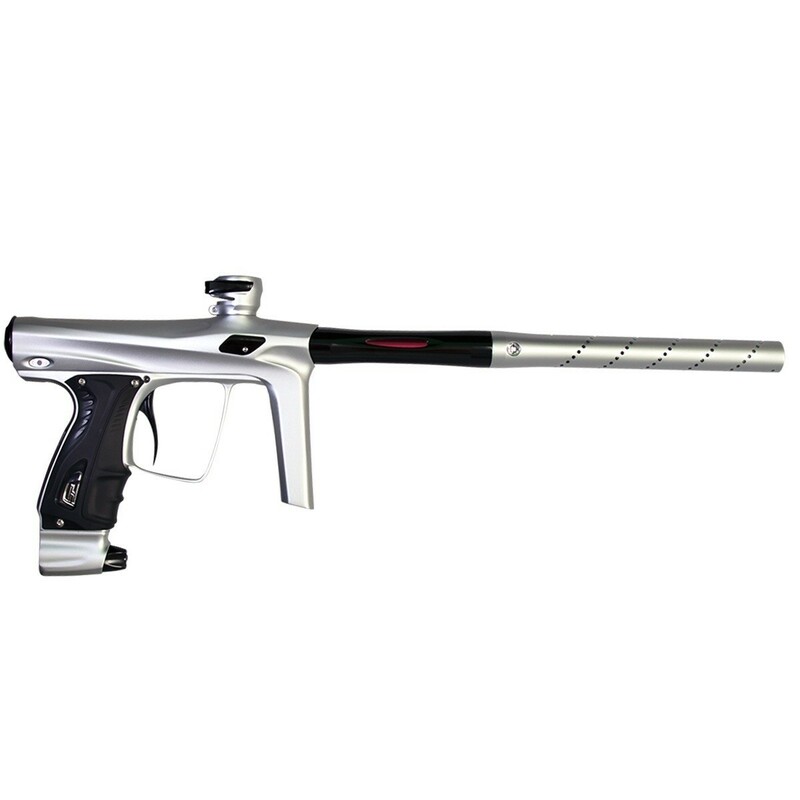 14-Inch All-American Freak - Only two things are better known in tournament paintball than the Shocker - The Freak and All-American barrels. The Shocker RSX comes with the best of both. The 'cocker threaded Freak back combines with optional inserts to adjust bore size for optimum performance when weather and paint conditions change. Helical porting keeps the All-American front quiet while dispersing air to reduce turbulence for tack-driving accuracy. Integrated Regulator - CNC machined from a single alloy billet, the Shocker RSX regulator housing blends seamlessly into the body with fluid lines, for a more compact, lighter marker with fewer possible peak points. Carry Case - From home to the field, or to the tournament, the Shocker RSX travels in armored style, protected in its included case.